The story of the book began with an opinion piece in The Des Moines Register in Oct. 2014 and ended up becoming a two and a half year-long project involving over 100 people, including Drake students and faculty. 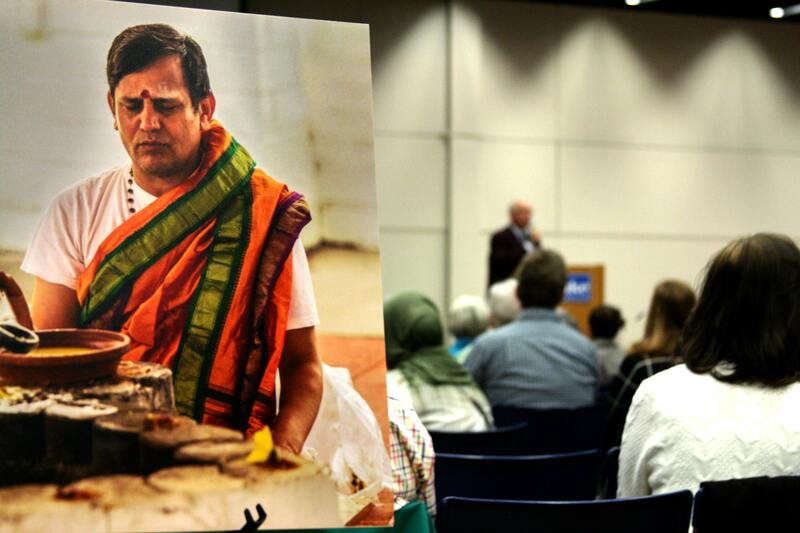 For the first 20 minutes of the book launch party in Parent’s Hall, visitors were welcomed into the room with Sitar music and traditional Jewish prayers, as well as an assortment of foods. 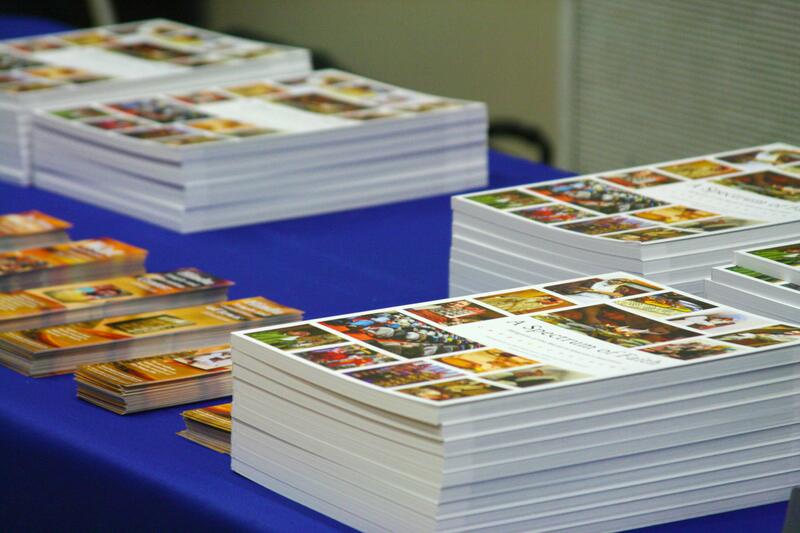 The food was traditional to some of the different faith communities represented in the book. 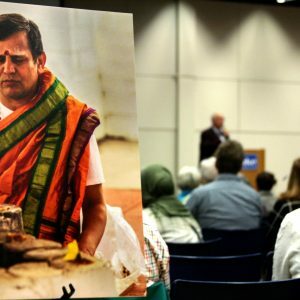 Copies of the newly released book, “A Spectrum of Faith: Religions of the World in America’s Heartland,” were available for sale. After the music, President Martin welcomed everyone, followed by the viewing of a documentary that showed the behind the scenes action that went into the production of “A Spectrum of Faith,” created by Drake digital media student, Anna Steenson. “This book was one person’s idea, and all of the sudden it involved so many hundreds of people. 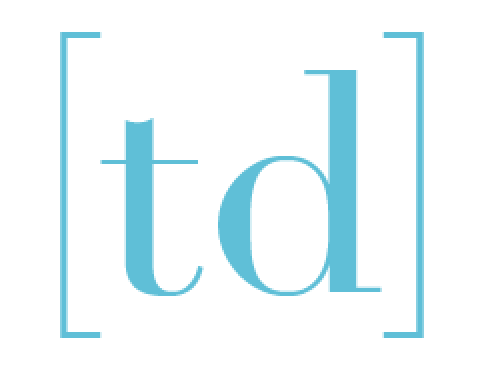 What I wanted the documentary to do is encapsulate the excitement, the passion … to show (the) diversity that Des Moines has to show … That’s what my goal was for the documentary,” Steenson said. The one person was Dr. Tim Knepper, professor of philosophy and director of The Comparison Project. “Two and a half years ago, a Vietnamese Buddhist community on SW 9th that we were working with, and teaching a class on, was bringing in a 40-ft. statue of Quan Âm to be dedicated, and I thought that was incredibly cool. So, I wrote an op-ed for it, and it went in The Des Moines Register,” Knepper said. The article in The Des Moines Register caught the attention of photographer, Bob Blanchard, who had recently moved to Des Moines for work. Blanchard went to visit the statue of Quan Âm and photographed for three hours. Afterward, Blanchard emailed Knepper looking for potential introductions to other communities to photograph. A writing intern, who was also writing for Knepper, informed Professor Carol Spaulding-Kruse, English professor and director of the Drake Community Press (DCP), of Knepper’s work. At that time, the DCP was looking for its next project, and Spaulding-Kruse invited Knepper and Blanchard to make a pitch to the DCP advisory board. Upon approval from the advisory board, the book project turned into a religion capstone project. Knepper had his students go to 15 different faith communities from six different religious backgrounds around Des Moines. For the entire semester, the students integrated themselves into their community, got to know the members and traditions and wrote about their experiences. These writings then went to Spaulding-Kruse’s English class, who worked as editors for the religion students, guiding the writers to share their experience as an outsider learning from the inside. After that semester, more students worked on editing and helping to make the book take shape. This January, another group of students helped to create a promotional plan for the book, including the book launch party. 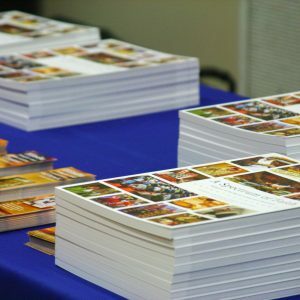 The book launch was a celebration of not just the hard work everyone put into the creation of the book, but also the diversity in Des Moines. Members of the various communities attended, mingled and sat amongst each other in the crowd. They gathered around prints of Bob Blanchard’s photographs and discussed them with each other. The Bosnian Women’s Choir, a part of the Ezan Islamic and Education Center, performed, as did the Bhutanese Bajan from the Hindu Cultural and Education Center. During the Bhutanese Bajan performance they pulled some of the students they knew up on stage to dance with them including Grace Boatman, an editor for the book, as well as Dustin Eubanks and Tierney Grisolano, both of whom authored one of the chapters in the book. Photography was displayed in Parents Hall in Olmsted. Pictured is one of the speakers sharing their experience with the book and religion in Des Moines. Several students who had worked on the project were in attendance to see the final product of all their hard work and look forward to what the book will be able to do in the future. “It’s such a powerful book. It’s doing such amazing work, just in terms of religious literacy,” senior John Noble said. Although the book is officially out now, there is still more to look forward to. Molly Adamson, junior, is currently working on an e-book of behind the scenes stories. Grace Boatman, senior, and two other students are working on educational supplements to help guide discussions around the book. Both of these are expected to be done by the end of the school year. There are also some “Meet my Religious Neighbor” events that will be happening. These events will allow members of different faiths to go in and see other religious communities in person. Anna Steenson’s video can be viewed on her YouTube channel: AnnaSteensonVideos. The book can be purchased through DMARC’s website. All proceeds from the book sales will go to DMARC’s food pantry to help fight hunger in the community, something that all faiths can get behind.